Diwan Magazine: Energy from the Space? Energy from Space - Crazy Dream or Real Possibility ? First published in German under the title „Strom aus dem großen Nichts?" in Esotera, No.11, November 1993. Presented here with a February 1998 update. Time and again we hear or read about claims of inventors, who believe they have invented machines powered by "Free Energy" from space. Engineers and scientists asked for their opinion about this usually state that such „perpetuum mobiles" (self-powered engines) are not possible according to the laws of physics. Not long after such announcements, we usually read reports making the whole thing appear as fraud or self-deception of the inventors. However, this matter cannot so easily be dismissed. Even if many of these inventions are indeed doomed to failure because of self-deception, fraud, or a lack of technical or scientific knowledge, certain findings of modern physics show that energy from space need not necessarily remain science fiction. T.H. Moray’s „Radiant Energy Device"
Impossible according to the laws of physics? Solution to the energy crisis at hand? „Electric Current from the Great Naught" Swiss newspapers announced in their headlines in June, 1993, when reporting about a company from Rapperswil on the lake of Zurich, Switzerland, looking for investors for the development and production of their „Space Quantum Motor". In a glossy prospectus, the company promises an „epochal trend-shift in energy production", which will replace nuclear and water power plants and will be more economical than solar energy. From mid-1994, they intend to be on the market with the domestic model RQM25 with an initial output of 20-30 kilowatts and with the bigger model RQM200 with an output of 190-210 kilowatts. However, given the fact that Jean-Marie Lehner, the principal shareholder and managing director of the company, „Raum-Quanten-Motoren AG", is connected to the circle of the dubious Swiss financial adventurer Werner K.Rey, some observers suspect the company may not at all intend to provide a "solution to all energy problems", but may have the sole purpose of making a lot of money. Although the company RQM is still operating, the „epochal trend-shift in energy collection" by the Swiss space-quantum motor still has not occurred in February 1998, five years after the publication of the paper. What has happened in the mean time? In September 1997, Jean-Marie Lehner, president of the board of directors and managing director of RQM Raum-Quanten-Motor AG at Rapperswil, Switzerland, invited the shareholders for the 4th regular shareholders’ meeting to Jona near Zurich (see Schöttl, 1997). In spite of the many critical questions from the 200 shareholders as to when the production and sale of the apparatus would be taken up and bring the long-desired dividend, Lehner managed with eloquence and tactical cleverness to obtain another raising of the stock from 4 to 6 million Swiss franks. He argued RQM was in need of new capital for the quick solution of the technical problems which repeatedly had occurred but basically were manageable. The biggest shareholder, the Leipzig company Genova, holding 25% of RQM with an investment of 4 million franks, presently was not willing to pay in additional funds. They now have massively lost voting power through the raising of the stock. The creation of new shares reserved for the RQM staff which would have shifted the voting balance to the advantage of the staff was not accepted by the shareholders. Like the raising of the stock, it was supposed to prevent the alleged unfriendly takeover by some „raider". The program of the shareholders’ meeting included the inspection of the RQM laboratory in an industrial building in the nearby village of Neuhaus, where the RQM testing station is operating since 4 years. According to a statement of the company, it has produced surplus electrical power up to a month before the meeting, but at the inspection by shareholders, experts, and the press its efficiency mysteriously was again lower than 1. In the summer of 1997, a scientific assessment by Professor Gruhn from the Technical College of Leipzig still had attested an efficiency of up to 4 to the RQM testing apparatus. Another fact is that the RQM prototype, in spite of the promise made by RQM to bring generators of 200 kilowatts output on the market by 1996, today shows an output of not even 1 kilowatt. However, I have to concede in favor of RQM AG that they now at least possess a working prototype, while in 1993 on the occasion of the first issuing of stocks, they did not even have construction plans for it and got the Eureka Inventors Prize in Brussels with a non-functional dummy. Lehner stated at the shareholders’ meeting that in 91 countries patents for the space-quantum motor have been registered and/or licences sold. For 1998 he announced the entry into the US market and the quotation of the RQM stocks at the NASDAQ risk capital stock exchange. According to Inge Schneider of NET-Journal (Zurich) (Schneider, 1998) major RQM shareholders contradict Lehner’s announcement that the breakthrough for RQM is imminent. On March 1st, the electrical mains network at RQM will be sealed to make an unquestionable examination of the input and output of the RQM installation possible. Then the input and output is to be measured by offical authorities, and in the case of good results, they intend to inform the public. But even after the achievement of good results, it will take at least a year and a half until the generator can go into mass production. Thus, it may well happen that other inventors who already now achieve „over-unity" with somewhat less PR and capital, will get in front of RQM. Inge Schneider points out that yet this spring the free-energy apparatus of Nelson Camus from Los Angeles, which was presented at their conference from December 6 (see Schneider 1997 und 1998), will be installed in a hotel in the Bernese Oberland, Switzerland. Although Camus presented his electricity bill as a proof that he no longer was drawing any electricity from the mains, Mrs. Schneider emphasizes that she has become prudent from many years’ experience with the „free energy" scene and will not believe it before the device has been installed and tested according to the conditions of the hotel owner and his consultants. From 1988-1993, the number of reports on various so-called „converters" for the conversion of space energy into electrical power or mechanical work has been increasing (Hilscher, 1981; Mielordt, 1984; Kelly, 1986; Schneider, 1989; Engeler et al., 1989; Kelly, 1990; American Nuclear Society, 1991); some of them have even been seen at work by witnesses or were tested by experts. In Europe, in most cases, however, just this has not been possible. In most cases, only their working principle was described or videos were shown, for instance at three conferences at the end of the 1980s: at the „Congress on Gravity Field Energy" at Hannover, Germany, in 1987; at the „Congress for Future Technologies" in Berlin, Germany, in 1988; and at the „International Congress for Free Energy" at Einsiedeln, Switzerland, in 1989 (Engeler et al., 1989). The most well-known of these converters probably are the so-called „Testatika" machine, developed by Methernitha, a religious community in the Emmental, Switzerland (Kelly & Bailey, 1991) and the so-called „N machine", developed in 1977 by the American, Bruce dePalma (dePalma, 1991). The Testatika consists of two contrarotating acryl disks of 80 cm diameter, an electrical circuit and a special kind of crystal-diode rectifier, and is said to produce an output of some kilowatt-hours of direct current of 10 amperes and a voltage of 250 volts at a certain rotary velocity, by separating electrostatically positive and negative aerions. The apparatus only has to be set in motion by hand at the beginning, and then operates by itself. In Europe, N machines have been reproduced and tested from the late 1980’s onwards by a German company at Dillingen on the Danube and on the occasion of a diploma thesis at the Higher Technical Institute in Wintherthur, Switzerland (Schöttl, 1989). They are based on a magnetic field which is rotating and spatially variable and is said to produce more electric power than is needed for its driving by an effect which was unknown to physics until now. At the beginning of the 1980s, a motorbike was seen in Munich whose motor was supplemented by a device for improving its efficiency. In 1989, the press announcement was given about the development of an energy generator based on high-frequency plasma discharges by the Russian plasma physicist Aleksandr V.Chernetskii, a professor at the Georgi Plekhanov Institute of the National Economy in Moscow (Samokhin, 1990). Plekhanov was reported to have obtained an output of five times the current he used for driving the device, and he believed he still could improve considerably on this result. The first trials to technically utilize the hypothetical space energy go back to the Serbian-American physicist and inventor Nikola Tesla (1856-1943) (Cheney, 1981; Seifer, 1996). In an interview he gave to TIME magazine in 1931, the founder of alternate current technology said he was working on a new energy source never before mentioned by any scientist and of high industrial value. The apparatus he had developed for tapping this energy from space was of astonishing simplicity and contained mechanical as well as electronic parts. In the same year, Tesla is reported to have operated a heavy deluxe limousine, a "Pierce-Arrow", by this device. The combustion engine had been replaced by an electric motor drawing its energy from a converter of 60 x 25 x 15 cm with an antenna. Tesla maintained the energy produced by the converter was sufficient to provide the lighting for a whole house in addition to powering the car. T.H. 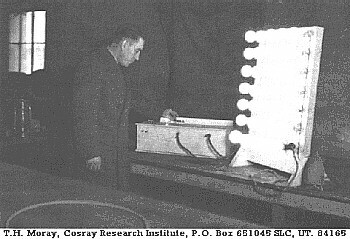 Moray's "Radiant Energy Device"
Among the historical examples frequently cited by present-day converter builders are a number of further inventions from the 1920’s and 1930’s. T.H.Moray standing in front of his"Radiant Energy Device"
The "Radiant Energy Device" by the electrical engineer Thomas Henry Moray, Ph.D., of Salt Lake City in its different versions contained some kind of transistor, various electrical circuits and up to 29 serially connected plasma amplifier tubes plus antenna and ground (Moray, 1978). It is reported to have produced an output of 50 to 70 kilowatt-hours; observers noticed that the fine wires which drew off the current always remained cool even after many hours of continuous operation. A central element of its working principle was the resonance-tuning of the electronic plasma in the tubes by which the „space energy" supposedly was picked up. 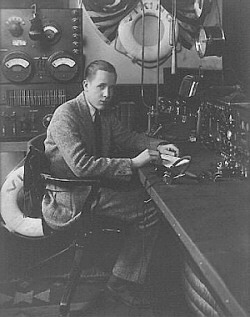 Another example is the „Magnetic Current Apparatus" by the German Navy Captain Hans Coler. Developed in the late 1920s, this converter used magnetically and electrically coupled circuits and worked without any moving parts. It produced only a small initial voltage but a very high current, resulting in an overall output of about 6 kilowatt-hours. The apparatus was tested in 1926 by Professor M.Klose of the Technical University at Berlin-Charlottenburg and by Professor W.O.Schumann of the Technical University at Munich, the discoverer of the Schumann resonances between ionosphere and earth. They confirmed that it worked perfectly but were not able to explain how the resulting output was produced. Klose found an efficiency of 450%; Schumann established that there was an output of 4.8 to 6.7 times the input. Schumann categorically excluded any deception. Shortly before the end of World War II, the development of the Coler converter was carried on by a consortium of companies headed by Siemens, by order of the German Navy Command. After the end of the war the converter was seized by the British Secret Service. In 1946, they drew up a detailed report on its findings which was partly declassified in 1962 (British Intelligence Objectives Sub-Committee, 1946). One of the many unusual and unexplained physical effects used in space-energy converters has been discovered in 1923 by Thomas Townsend Brown, engineer in the US Navy, and by Professor Paul Alfred Biefeld. They found that a condenser with horizontal pole ends, when freely suspended by a string and subjected to a high electrical voltage, experienced a propulsion in the direction of the positive pole. If the condenser is lying on a balance with a perpendicular arrangement of the poles, it is lifted if the positive pole is directed upwards and becomes heavier if the positive pole points downwards. Based on this „electro-gravitative effect", T.T. Brown in 1926 described a „space vehicle", in 1928 constructed a model boat, and in the 1930’s built UFO-like flying disks. Six US patents for motors and other apparatus based on the Biefeld-Brown effect are filed in Brown’s name, the last one in 1965. Since the 1930s, the number of known converter types has steadily increased. As described in the excellent booklet, „Energien aus dem Kosmos - Theoretische und praktische Grundlagen einer neuen Technologie" (Energies from the Cosmos - Theoretical and Practical Foundations of a New Technology), by Swiss electrical engineer Adolf Schneider (1989), these are based on a number of different working principles. Already around 1950, Nobel prize winner Werner Heisenberg (1901-1976) had said that it should be possible to use magnetism as a source of energy. He added: „But we science idiots will never make it; it has to be done by outsiders". In fact, most converters work with certain arrangements of magnets and utilize some little known effects of magnetic fields. According to Schneider (1989), the converters based on magnetism either (a) convert mechanical energy into electrical one; or (b) produce mechanical energy from the magnetic field by utilizing the attraction respectively repulsion forces of strong permanent magnets; or (c ) directly produce electrical energy from rotating magnetic fields (as does the above-mentioned N machine); or (d) generate electrical energy by periodic time-varying or space-varying of magnetic fields (as in the so-called „Kromrey machine" from Geneva, 1963); or (e) recollect energy from the process of remagnetization (this principle is used by the above-mentioned motorbike and by an invention of the Viennese engineer Franz Seidl). Non-magnetic principles used are the energy collection by resonance tuning (as in the Testatika, John Bedini’s converter, 1984, see Bedini, 1991, and in the Chernetskii converter), electrogravitation (used in addition to T.T.Brown’s inventions in John Searl’s flying rotor disks), and finally analogous magnetogravitation as used in an invention of William Hooper. In the latter, a strong induced electrical field generates an attractive resp. repulsive force upon electrically neutral matter which depends on the strength of the current. This force cannot be shielded. A last principle, discovered by the Japanese physicist Shinichi Seike, is the production of electrical energy by strong magnetic fields arranged in a special topology. Seike’s devices are said to be able to generate also antigravitation fields instead of electrical current. A fool’s paradise of unlimited energy, almost for free, obtained through mysterious devices - the technical control of gravity: Such science-fiction-like claims strongly resonate with primaeval human dreams and are therefore bound to stir unbelief and scepticism as well. Innumerable inventors have believed to have found the perpetuum mobile, and the scientific community, made wiser from such experiences, already habitually reacts with defence, if not with derision and ridicule. Every single physicist and engineer has learned that a perpetuum mobile - a machine which performs work or produces energy from nothing - is impossible, because such an undertaking is not allowed by the first law of thermodynamics. This „Law of the Conservation of Energy", formulated in 1842 by Julius Robert Mayer (1814-1878), states that the sum of all energies always remains the same, and thus energy can only be transformed into another form (e.g., heat into work) but cannot be generated or annihilated. The conclusion is drawn that machines with an efficiency of more than 1 (100%), producing more energy than is used to operate them, cannot exist. As Gottfried Hilscher claims in his book, „Energie im Überfluß" (Energy in Abundance) (Hilscher, 1981), this is already refuted by the heat pump which, by the way, first was developed by Nikola Tesla. Whereas, for instance, conventional electrical power stations have weak energetical efficiencies of under 40%. With heat pumps, it has been possible since the 1980s to obtain efficiencies of nearly 2. According to Hilscher, the energy conservation law is only valid for closed systems and linear effects. But in space-energy converters, especially if magnets are involved, we are dealing with open systems drawing their effective energy from a cosmic energy field, the „gravity field", „tachyon field", or „zero-point energy field". He maintains that the converters produce nonlinear effects which violate the energy conservation law. The fact that today even renowned physicists at least theoretically do not exclude the possibility of energy collection from space is demonstrated by the special issue on „Speculations in Energy" of the journal „Speculations in Science and Technology" published in 1990. In the light of the recent recognition of the so-called „vacuum energy" or „zero-point energy" by modern physics (Puthoff 1987, 1989a, 1989b, 1991; Milonni, 1994; Powell, 1994), the energy of space is now no longer a fantasy, and its technical utilization has become in the least a matter of serious discussion. As to its chances of concrete realization, the authors of the special issue have strongly diverging views. For some it is already at hand, while for others it still has a long way to go. Although there is no doubt that on its long way through history it has gone through many transformations of meaning and changes of context, we may say that the vacuum-energy concept of modern physics is an up-to-date version of the ancient concept of the „ether". The „akasha" of Indian philosophy and the „aither" of the ancient Greeks was the „quintessence" of the five elements from which the material world was composed, and at the same time, represented empty space and some subtle primeval energy or substance. In ever-changing forms and by many different names, the concept of the ether played a role in the physics, philosophy, biology, and medicine of the occident up to the physics of 19th Century. In physics, Isaac Newton espoused it as well as later Maxwell and many others for whom the ether was the carrier medium of all electromagnetic waves (Cantor & Hodge, 1981). According to general conviction, the theory of the ether was refuted in physics at the end of last century, when the American physicists Albert A. Michelson and E.W.Morley, in a famous series of experiments from 1881 to 1889, were unable to demonstrate the relative movement of Earth in some ether thought to be stationary - the so-called „ether drift". In 1905, Albert Einstein, in his „Special Theory of Relativity", which was based on this result, rejected the idea of an ether and only used space itself as carrier of the electromagnetic field. In fact, the existence of the ether had not been refuted at all, nor by the Michelson-Morley experiments, nor by his theory, as Einstein admitted himself on May 5, 1920, when he said in a speech at the University of Leyden that „to deny the ether would mean, in the last consequence, to assume that empty space possessed no physical qualities whatsoever" (Einstein, 1920). In reality, physics had only liberated itself from the blind alley of the mechanical ether which had blocked the physics of the 19th Century and had returned to another kind of ether, more akin to the original Indian „akasha". The development of quantum physics would soon fill again the allegedly „empty" space with a new „quantum ether". In 1916, the great physical chemist and Nobel Prize winner in chemistry of 1920, Walther Nernst (1864-1941), argued that even in empty space and at the absolute zero temperature point the electromagnetic field must be in a state of ceaseless activity, the so-called „quantum fluctuations", and thus still possess a certain energy. However, this „zero-point energy" (ZPE) remained controversial until Werner Heisenberg showed in 1925 that its existence follows from the uncertainty principle of quantum mechanics. The general recognition of ZPE finally came in 1927 with its incorporation into the theory of Quantum Electrodynamics by Paul Dirac. Thus the vacuum is far from being empty - it is, even in the absence of matter, filled by a „sea of energy", whose density according to cautious estimates is of the order of nuclear energy. In 1948, the Dutch physicist Hendrik Casimir and his American colleague Willis Lamb demonstrated by means of the Casimir and Lamb effects (which today carry their names) that this energy by all means has concrete, measurable consequences. The effects have been repeatedly experimentally proven since then. At the end of the 1960’s, the American physicist Timothy Boyer showed that many quantum-mechanical effects can be explained by the interaction of matter with the ZPE (Boyer, 1975, 1980), and the well-known Russian physicist and citizen’s rights activist Andrei Sakharov demonstrated that gravitation may not be an independent force but may be based on some electromagnetic effect (Sakharov, 1968). It can be understood as a consequence of changes in the vacuum energy caused by the presence of matter. Very recently, the vacuum energy has started to play a steadily increasing role in several fields of modern physics. In this process, the works of the American physicist Harold E.Puthoff, who developed Boyer’s approach, have had a strong influence (Puthoff, 1987, 1989a, 1989b, 1991). He showed in 1987 that matter may owe its stability to the ZPE. The electrons „orbiting" around the nucleus of an atom would crash into the nucleus if the energy they continously radiate would not be „replenished" from the vacuum. Puthoff was also able to confirm Sakharov’s view that gravitation may arise directly from the ZPE. The new field of Cavity Quantum Electrodynamics, barely ten years old, finally shows that the vacuum plays a very special role in radiation processes within small cavities (Berman, 1994). The new effects discovered by this new branch of electromagnetics possess great significance both for technology as well as for biology, because the conditions for their occurrence are fulfilled in cells and other biological cavities, not least of them the DNA molecule (Popp et. al., 1992, 1994; Bischof, 1995). Solution of the Energy Crisis at Hand? Does all this mean the solution of the energy crisis will come from the utilization of vacuum energy? As Puthoff writes in the above-mentioned special issue of „Speculations in Science and Technology", in spite of all the innumerable converters, he could not see at the moment (that was, in 1990) any clear experimental proofs or any complete and convincing theoretical foundation for it. He quotes the author of the Russian vacuum book, „Something Called Nothing", Roman Podolny, who writes: „It would be just as presumptuous to deny the feasibility of useful application as it would be irresponsible to guarantee such application" (Podolny, 1986). Thus until further notice, hydrogen, solar, wind and tidal energy, will remain the only renewable and clean alternatives to nuclear and fossil energy sources. American Nuclear Society (ed. ): Advanced Energy Concepts I, II, III, IV. Proceedings 26th IECEC, 1991, Vol.4, pp.311-492. Anderson, Selby: In search of zero-point energy. Planetary Association for Clean Energy Newsletter, Vol.5, Nos.1&2 (1986), pp.6-10. Bedini, J.C.: The Bedini free energy converter. In: Proceedings of the 26th IECEC, Vol.4 (1991), pp.451-456. Boyer, Timothy H.: Random electrodynamics: The theory of classical electrodynamics with classical electromagnetic zero-point radiation. Physical Review D, Vol.11, No.4 (1975), pp.790-808. Boyer, Timothy H.: A brief survey of stochastic electrodynamics. In: Barut, M. (ed. ): Foundations of Radiation Theory and Quantum Electrodynamics. Plenum Press, New York 1980, pp.49-63. Cole, Daniel C.; Puthoff, Harold E.: Extracting energy and heat from the vacuum. Physical Review E, Vol.48, No.2 (1993), pp.1562-1565. dePalma, Bruce: Magnetism as a distortion of a pre-existent primordial energy field and the possibility of extraction of electrical energy directly from space. In: Proceedings of the 26th IECEC, Vol.4 (1991), pp.429-432. N.N. : Where does the zero-point energy come from ? New Scientist, December 2nd, 1989, p.36. Puthoff, Harold E.: The energetic vacuum: Implications for energy research. In: Special Issue on Speculations in Energy. Speculations in Science and Technology, Vol.13, No.4 (1990), pp.247-257. Sakharov, Andrei D.: Vacuum quantum fluctuations in curved space and the theory of gravitation. Soviet Physics Doklady, Vol.12 (1968), p.1040. Samokhin, A.: Vacuum energy - breakthrough ? In: Special Issue on Speculations in Energy. Speculations in Science and Technology, Vol.13, No.4 (1990), pp.273-275. Schneider, Inge: persönliche Mitteilung, 25. Februar 1998. Schöttl, Herbert: Diploma thesis at the Technical School Winterthur „N-Machine". In: Engeler, Peter; Mueller, Eike; Rusterholz, Werner (editors): Proceedings of the International Congress for Free Energy, 1989, Einsiedeln, Switzerland. Swiss Association for Free Energy (SAFE), Einsiedeln, Switzerland, 1989, pp.37-0 to 37-8. The concept subsumes „Methods of energy generation that produce a net energy (the output) which exceeds the total energy input by some measurable quantity (the so-called „over-unity effect"), thus activating some potential energy in the environment" (Valone). Conventional examples are the heat pump (originally invented by Nikola Tesla), solar and wind energy, and the conversion of thermal energy from the sea. However, in the Frontier Sciences other kinds of „Free energy" technologies play a more important role, the so-called „non-conventional energy technologies". They are „unusual or unique methods for energy generation which anticipate or necessitate a further development in theoretical physics" (Valone). The most important group of these methods is based on extensions of the theory of electromagnetic theory and/or the theory of relativity which allow the hypothesis of energy generation from the vacuum, the so-called „empty space" of physics. They include, for instance, Thomas E. Bearden’s „scalar wave" theory and the Russian „torsion field" theories. Bischof, Marco: Strom aus dem Großen Nichts?. Esotera Nr. 11 (1993), pp. 92-97. Valone, Thomas: Non-conventional energy and propulsion methods. Proc. 26th IECEC, Vol.4 (1991), p. 440.